The C 590 Pro is built with a self-cooling 2.6 DurX™ motor, so it will power you through the miles to come. Quickly and easily adjust the treadmill speed up to 10 mph and the incline up to 10% with the OneTouch® controls on the console. Select from 20 different workout options focused around incline, calorie burn, interval training, intensity, and speed. Plug in your device via the auxiliary music port and listen to your workout playlist through dual 2-inch speakers. 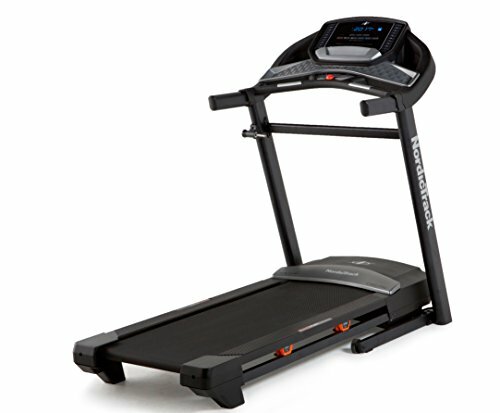 Fold up the treadmill deck after your workout using the unique SpaceSaver® design for a quick and easy storage solution. Automatically Track Your Stats: Watch your workout progress on the high-contrast display in time, calories burned, and distance. Elevate Your Workout: Take your workout up to 10% incline to build your strength and stamina. Heart Rate Zone Training: Place your hands on the built-in grip sensors for a quick readout directly on the console.